Finally I'm sitting down to write out my New Year's Resolutions before it feels to late to be rambling on about them. Instead of purely blog resolutions that you are likely to fall asleep at or endless life resolutions that I just won't stick to past February, I thought I'd do a mix of three areas which I want to tweak to varying degrees. I'm not a strong believer in making New Year's resolutions but I'd like 2016 to be my year (2015 wasn't bad tbh) and January seems like a good place to start! Towards the latter end of last year I spent most Monday-Friday's working and living for the weekend. Of course that's not a bad thing but my weekdays felt boring and watching TV every night for hours became the norm. So this year I want to slowly get out of that rut, easier said than done when it's so cold and dark out past 4:30pm, and do more to make my week days happier! I plan to make a list of possible things on my phone but going late-night shopping is always possible, going to the cinema, eating out, visiting family and I'm in the process of finding a nice gym to be able to swim at! Last year was the year I tackled my anxiety and amazingly I can now go months without it appearing. This took me to realise that is was important to live the life that was best for me and not to be ruled or even swayed by others. I'm now so much happier with my life on a daily basis but it's also made me aware of how precious and often fragile our mental health can be. So 2016 is the year I plan to good to my mind - realise when I'm feeling stressed and let myself take a break, to enjoy nature and swimming more and to practise Mindfulness much more as I'm a big believer in it. In the past I've been worried about anxiety creeping back into my life but with this new approach I hope to enjoy life more honestly and cast them worries aside. Get back into past passions - reading and cooking! Now this should be an easy one as I received so many books and quite a few cookbooks for Christmas. Of course cooking from scratch and trying new recipes is linked to eating healthier but I also really enjoy cooking and tweaking recipes. My new favourite cookbook is Lean in 15 by Joe Wicks (Amazon £6..99 here) which I plan to work through and actually try out a good portion of the recipes instead of just browsing through them! I may even do a blog post in a month or so about the recipes I've tried and to show photos of the finished results for both the Lean in 15 and a few other new cookbooks I'm using - let me know if you'd be interested in that! As for reading I'm currently reading Ready Player One, which I'm enjoying so so much but I'm aware that even though I love reading I often don't make time for it, so I'm going to try to read before bed much more and use Sunday's as a time to read for a few hours. Fingers crossed I can keep up both passions over the course of 2016! As I mentioned above I'd like to write a blog post on the recipes I try out from various cookbooks in the next few months and this was something I wouldn't have felt I was able to do on my blog in 2015. I'd also like to write about what I've been reading and watching as a new monthly series and even document a few holidays I have planned this year! I know I could set many blog goals this year but I want 2016 to be the year I enjoy writing Makeup Savvy even more and worrying less about stats and the growth of my blog! For the past few years I've loved skincare more and more but with being a blogger I try so many products that my routine isn't really a routine at all as I'm constantly switching it up which often affects my skin both good and bad. But now that I love so many great products that work for my skin I think it's time to stop trialing skincare products just for review purposes and create a good skincare routine both day and night that I want to stick to. This will be a range of both high and low end products that I will be sharing with you soon in a blog post and only changing up slightly with each season. Start using eye cream, nightly! With my 28th birthday in 5 months I've starting to realise that signs of ageing will start to appear and other than a high factor sunscreen in summer I'm doing nothing to help slow down the ageing process of my skin. As I have an oily/combination skin type I feel any anti-ageing face cream, especially night creams, are off the cards right now but one product I could be using is a good eye cream. I've dabbled in a few over the years but I've never loved anything enough to re-purchase so in the next few months I hope to find the eye cream that I will use daily and keep on using. Any recommendations would be really helpful! Lastly a purely makeup goal of wanting to finally master a few makeup techniques as I have all the makeup and ton of brushes yet I feel I'm not there with application. So 2016 is the year I binge watch makeup videos on YouTube and master both contouring and the perfect smokey eye. I already love Pixiwoo but I'd love more recommendations of people to watch and learn from if you have any! 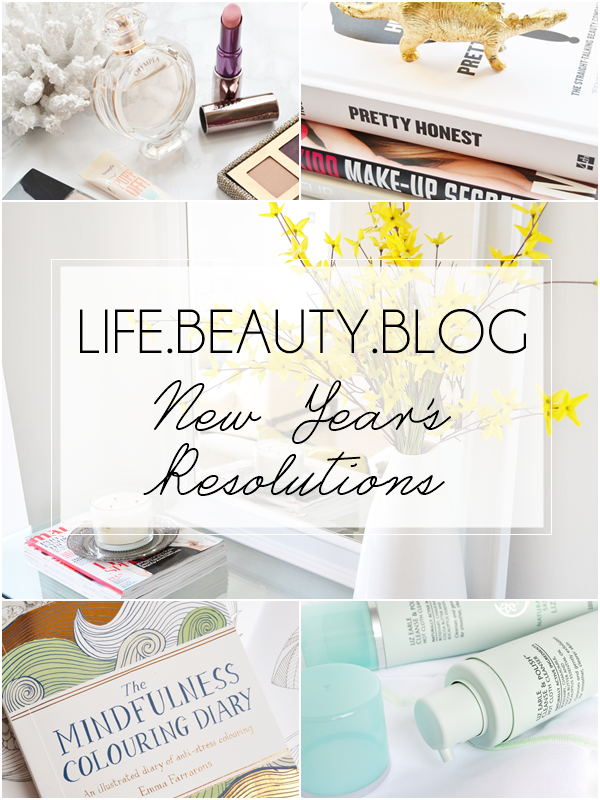 I'd love to hear if we share any similar New Year's resolutions and if you're a blogger and have wrote your own resolutions I'd love if you could leave your link to it so I can have a read!